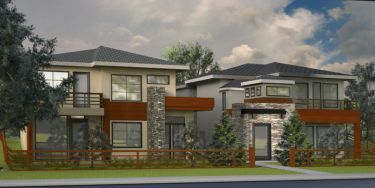 Blue Mountain Estates: Consists of four townhouses within two duplexes. This amazing three bedroom + LOFT home is centrally located in the heart of Coquitlam. Walking distance from shopping, restaurants, schools, parks, Vancouver Golf Club and much more... Features include: built in dishwasher, microwave, wall oven, gas cook top, stainless steel appliances & chrome fixtures, quartz kitchen & bathroom counter tops, wood laminate/tile & carpet flooring, birch wood custom kitchen & bathroom cabinets with soft closing drawers and adjustable shelving, fireplace, skylights, double glazed windows. Lighting fixtures include one chandelier, two pendants & three bathroom lights. Don’t miss out.